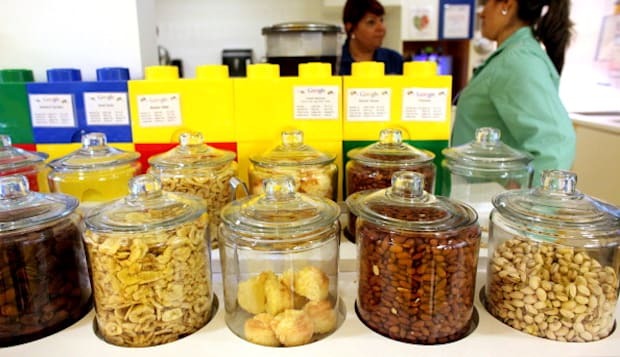 Getty ImagesGoogle cafeteria: please don't take away our nuts. The IRS wants to take away your sandwiches. That's to say: if you work at a tech firm that serves free lunches, like Google or Facebook, the IRS is strongly considering taxing that and other employee perks. Think haircuts, free gym memberships, and anything else that could be construed as a means of pseudo-compensation. "I clearly think it ought to be taxable income," University of Florida tax law professor Martin J. McMahon, Jr. told the Wall Street Journal. "I buy my lunch with after-tax dollars. And I have to pay taxes to support free meals for those Google employees." Those famously elaborate Google cafeterias verge on Epcot-like food courts, with sushi bars, exotic condiments, and more noodle options than a street in Chinatown--all offered to employees at no charge. The companies that would be affected by the new tax argue that perks like free lunch improve employee productivity, effectively reducing the time they spend away from their desks. This makes them incentives, rather than just perks--something that's much harder for the IRS to tax. "Our customers win [because] they get a higher quality product, and then our shareholders win because they see our momentum in the market," Andy Byrne, CEO of tech company Clari, told Fox News. "If the IRS wanted to stop the productivity of Silicon Valley and of the economic growth engine that this place is, then they can have at it." In the event that the IRS does crack down on employee perks, legal experts agree that companies will probably just report them as taxable income, and boost salaries to make up the difference. After all, as Byrne would have it, free pad Thai is the one thing between us and total economic collapse.